This is a very beautiful Duvet and it is just what I was looking for. It looks beautiful on our bed and would recommend it to friends. Right now we are using it as a bedspread without inserting the comforter to keep it light weight and it looks great. Gorgeous blossoms in a vintage-inspired pattern throughout the Laura Ashley Elise Duvet Cover Set celebrates the beauty of spring flowers budding to life. 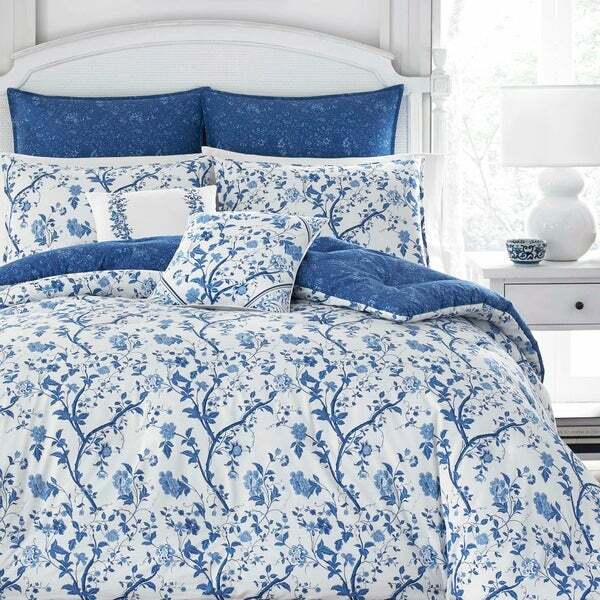 The sophisticated bedding is gracefully decorated with a classic floral pattern in blue and white. Duvet cover features button and tie closure. Machine washable for easy care. Duvet Cover Set includes: One twin duvet cover (86"X66") and one standard sham (21"X27"), Full/Queen Duvet Cover Set includes: One full/queen duvet cover (92"x88") and two standard shams (21"X27"). King Duvet Cover Set includes: One king duvet cover (92"X106") and two king shams (21"X37"). "What color are the shams?" The shams are blue and white they match the duvet cover. "What are the dimensions of the king size?" The king duvet cover is approximately 92 inches x 106 inches. The shams are 21 inches x 37 inches. "Is this a duvet or comforter? Does it require an insert?" As it says Duvet Cover in the title you should assume it will need the insert.